Keri Heitner, Ph.D.; Leslie Miller, Ph.D; Robert Bruen, Ph.D. 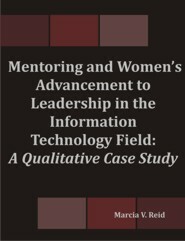 The purpose of the qualitative case study was to explore and identify the patterns and types of obstacles women in the information technology (IT) field experience in advancing to leadership positions and to explore the mentor-mentee relationship of female organizational leaders in the IT field and its effect on the advancement of women to leadership positions. The sample consisted of two groups of women, one in leadership (10 cases) and the other in nonleadership (10 cases) positions, in the IT field in the eastern United States. Content analysis and NVivo 7 software were used to analyze the interview transcripts and observations for common themes. The results revealed (a) mentor-mentee relationships play a key role in women's advancement in the IT field, (b) gender discrimination still exists in the IT field, (c) the old boys' network still exists in the IT field, and (d) there is a lack of mentoring programs and services in the IT field.